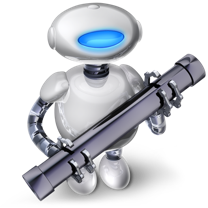 Welcome to Online Training for Automator! The automation technologies in Mac OS X are designed to be used by the widest possible audience: from those who have a technical side and enjoy writing their own automation code, to those who just want to use the available automation tools. Automator is firmly in the middle of those two camps. It enables you to create customized automation “recipes,” without having to write any code! Using a simple drag-and-drop process, you can easily create tools to make your compuer life easier. The easiest and the best way to get up-to-speed on Automator, is to click the image to the left, and watch the 7-minute video introduction to Automator. The video starts at the very beginning and explains what Automator is and how it works. After you’ve watched the movie, you’ll be ready to take a hands-on approach and follow the other steps below to create your own Automator workflows. Each of the following tutorials is fun, easy-to-follow, and only take a few minutes each to build. 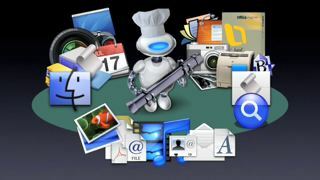 Each tutorial introduces a new feature and ability of Automator. When you’re done with the tutorials, you’ll be ready to explore on your own. Enjoy! The first tutorial is a simple workflow for creating new Mail messages containing a video snapshot of you. Here’s how! Click here to visit the Automator website to access more instructional materials, downloads, and links to other sources of information.